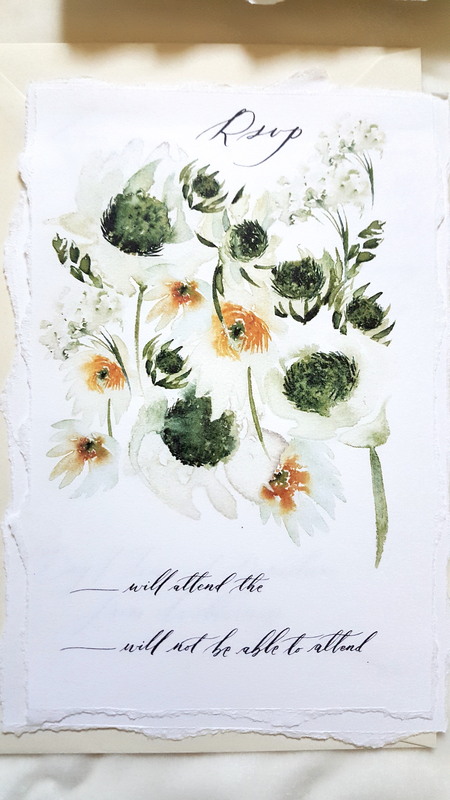 My heart is a popping from my recent collaboration, full of beautiful wildflowers watercolour illustrations for a wonderful bespoke watercolour wedding invitations project. I’m so excited to be working with luxury wedding planner, Michelle, A Pocketful of Dreams for her client’s wedding in Wilderness Estate, Surrey. 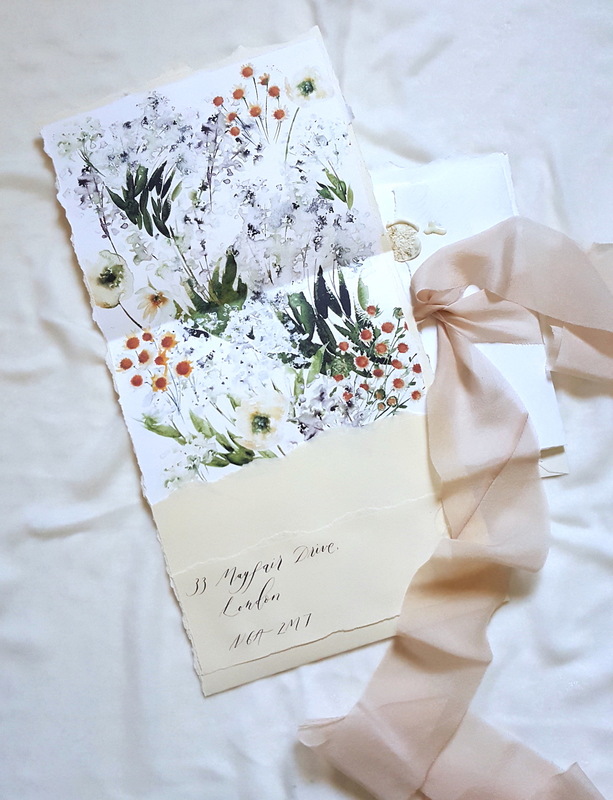 What exactly are bespoke watercolour wedding invitations about? 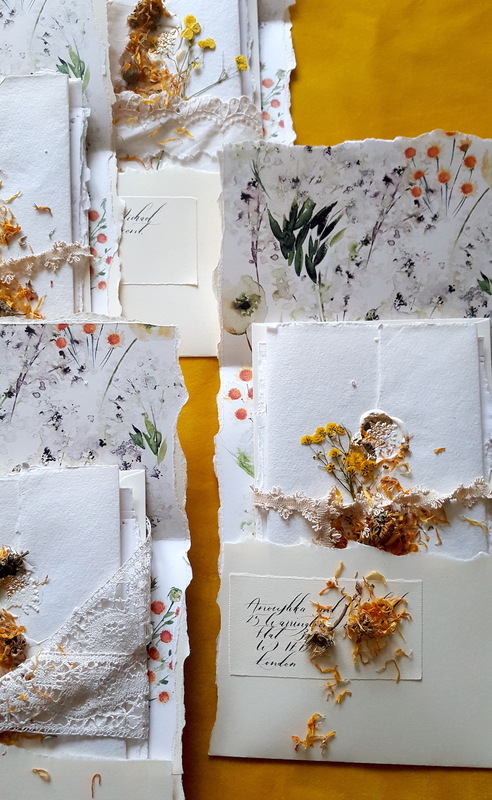 As an luxury invitation designer, I will take you behind the scenes and show you a bespoke, meaning especially custom designed for you and watercolour, yes I literally create original watercolour hand painted artwork to create a unique set of wedding invitations, centred around wildflowers. 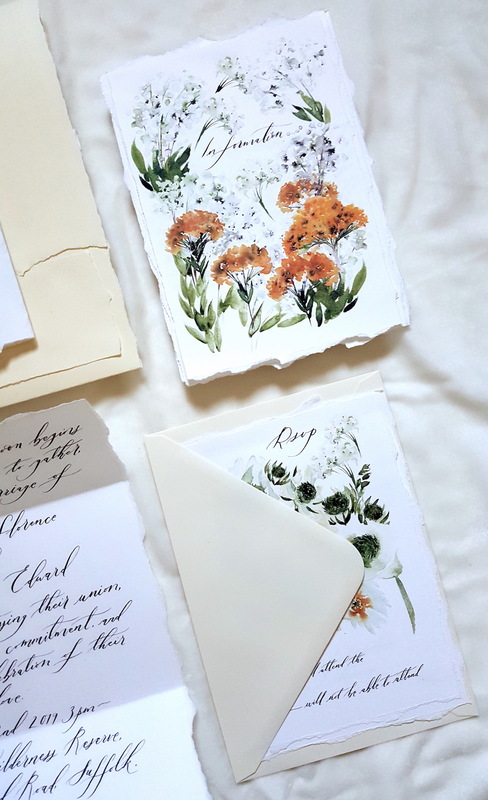 Here I will show you my process behind designing an invitation, information pack, envelope liner and an rsvp two paged design. 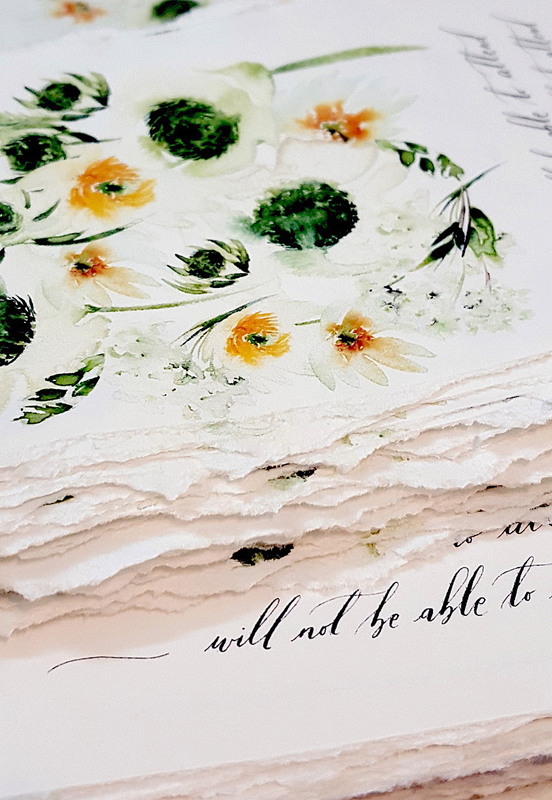 Before I share the bespoke watercolour artwork for the invitations that I created, I thought I would take sometime and give you a little background and speak about my process. 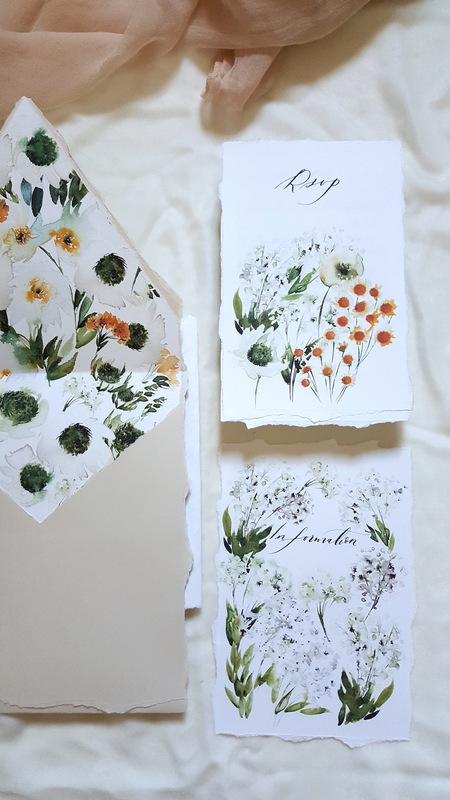 I just had to share it with the world and thought it would be interesting to show you part of my design process as a hand painted wedding invitation designer. Normally it is known that you should put out what you hope to attract in. I mean that in terms of design. To elaborate, I mean that as a wedding invitation designer and a creative professional, you have to create and display the type of work that you wish to be hired for. I am an avid listener to many creative types of podcasts, ranging from wedding planners to high end photographers. They all say the same thing. Work on passion and personal projects and publish your work. If you want to be hired for a certain type of job or client, make it up and self assign that to yourself. That is why I allowed myself the time, and yes it was a pretty long time, of two years to develop and work on my own series of passion projects. I worked constantly creating directly from themes of inspiration that lit my heart up. After two years of constant design work, constant style shoot collaborations, my signature style definitely developed to be a dark, moody black and gold style as you can see here. So, for the type of work that I put out, mostly black and gold, I am really surprised when I have in the past, and with this wonderful project been asked to work on something light and bright! It is completely different to my work and couldn’t be more of a stark contrast, but I think that people see the potential of my designs. Perhaps they feel that I have that delightful delirium about creation in general and perhaps they enjoy the way that I approach design and that’s why they reach out? Nonetheless, I am so happy to have this super beautiful project brief come over and here below is how it all started. Mood board provided by client. I’m so happy that this lovely client gave me the mood board above. I am a VERY VERY visually inspired person. 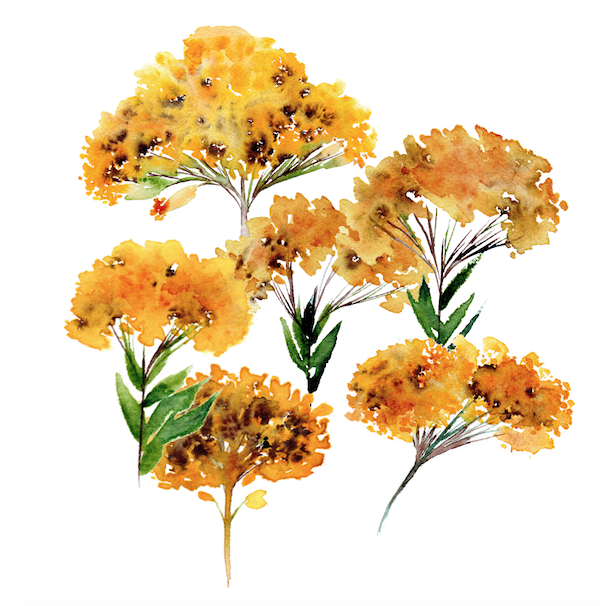 When I set about to create artwork for watercolour wedding invitations the more visuals I have the better. 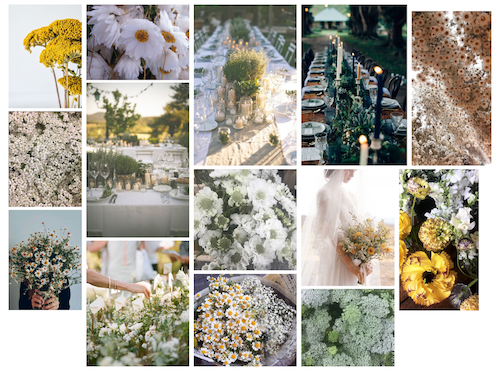 I literally set about copying and pasting all of the images from the above mood board. I blew them up to fill a page and printed out lots of images, so that I could sit down with lots of pictures to paint from. Which is how I work best. Words like, “I want something pretty and romantic” don’t help enough. I have often gone off on the wrong creative direction because a client gave me a few words and expected me to completely form a finished design, that is what I find really stressful. Mood boards and lots of photos of what I should base my artwork on, is a wonderful way to set me towards the right direction. As well as plenty of white flowers with bursts of green and yellow in their centres. Think of a relaxed, rustic and bohemian vibe, peppered with organic prairie influences reminiscent of a wild overgrown English woodland garden. 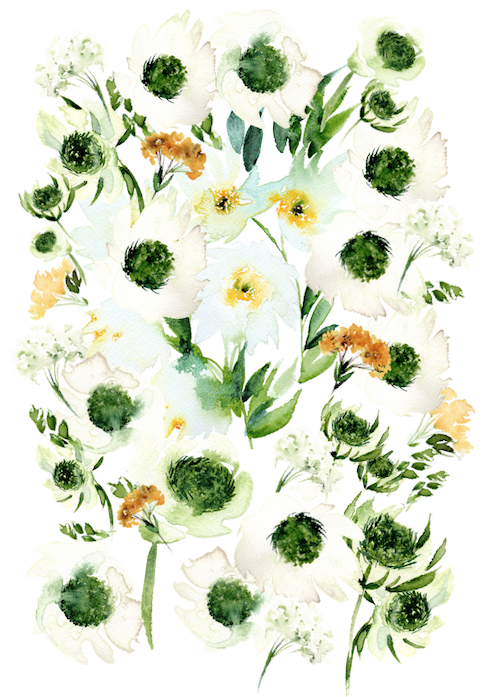 Now white flowers have always, always posed a challenge for me and as you can see from the entirety of my portfolio, I have pretty much steered clear from attempting any designs with them! 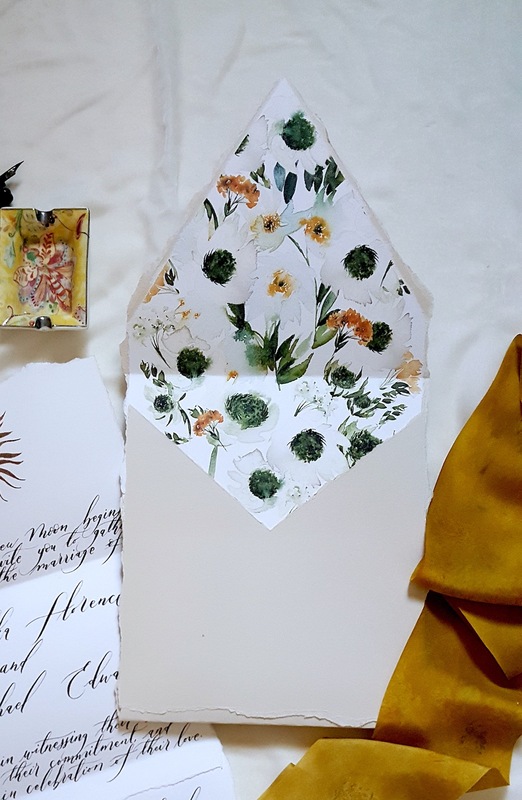 Yet, I was happy for the challenge and below I’d like to share the series of paintings that I developed as a first step to create a suite of bespoke watercolour wedding invitations. 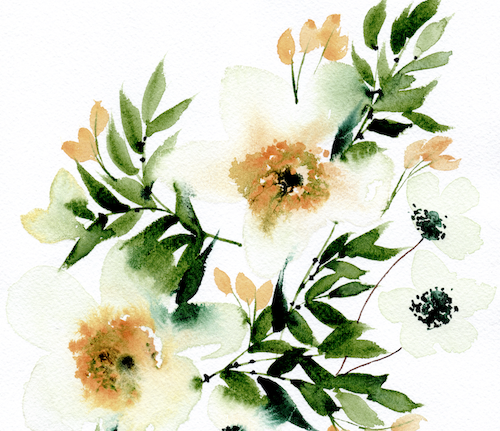 The secret to producing watercolour artwork with white flowers, is to add a slight hint of deep green, or light brown to give the white a little depth. Otherwise, you simply won’t see the watercolour when it is scanned in. 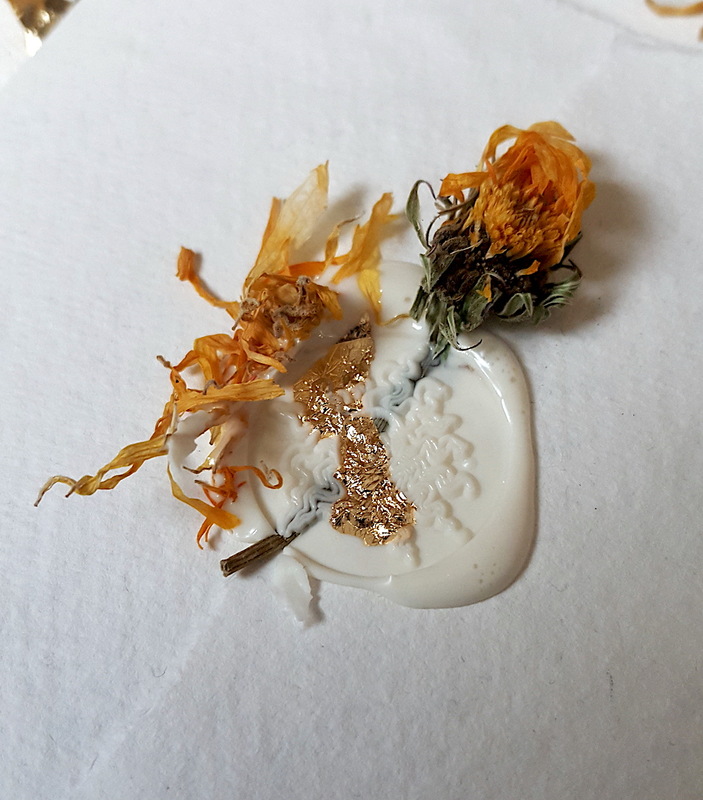 Also adding lots of yellow specks, to create the flowers centre, while the paint is wet, gives it a burst of colour and helps to add a burst of colour that bleeds through the white and adds definition. 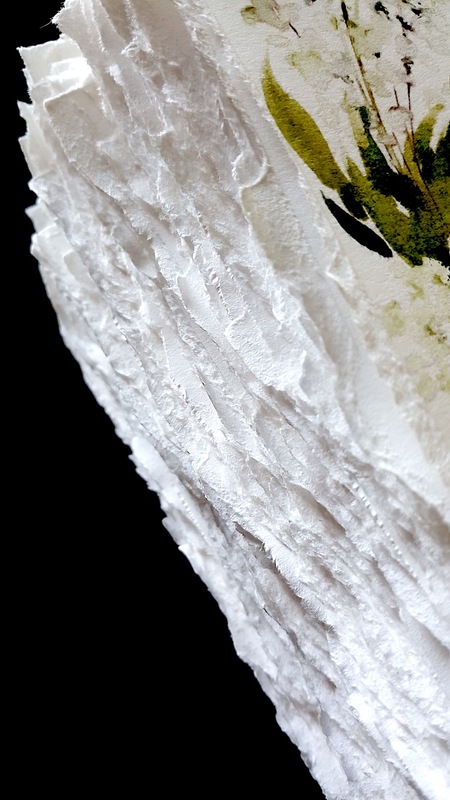 Again these sorts of white watercolour paintings really took so much time to perfect. I had to really dedicated some significant time, to get into the flow. 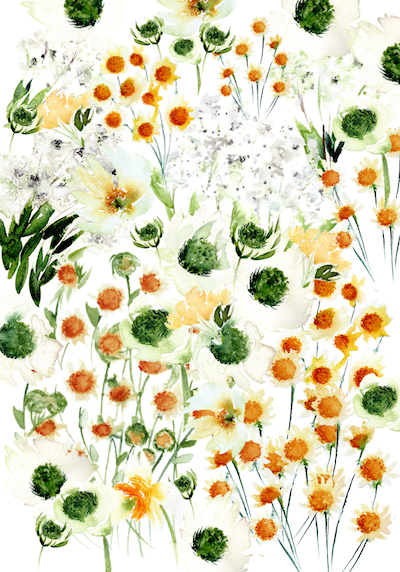 The watercolour floral illustrations that I’m showing above didn’t arrive magically from my hands. 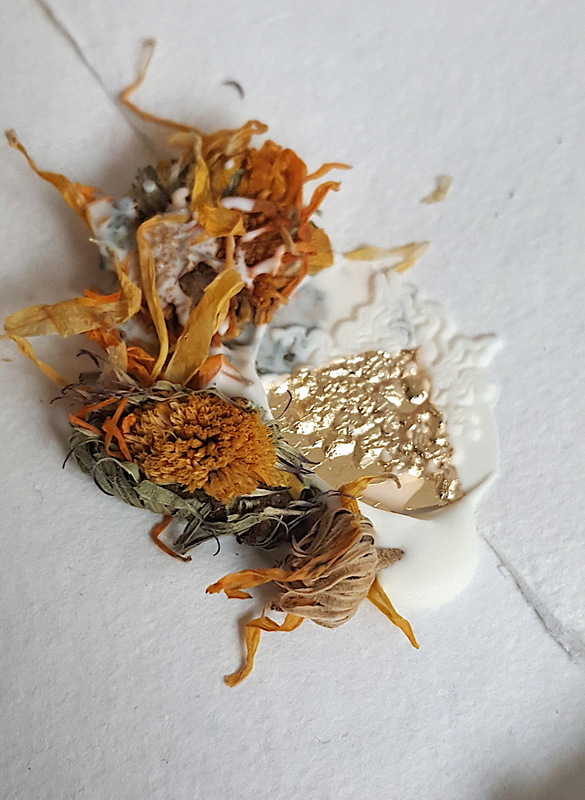 When I set about to create the artwork for any project / client, whether I’m designing black tie wedding invitations or floral watercolour wedding invitations I need patience to get there. Believe me, the 1st, 2nd, 3rd and 4th piece were all thrown away, because they were that awful! But I know that about myself. I know that the first few designs are always a warm up and I have to get to the 7th piece of work before all the good stuff starts to arrive. Still, I was rather afraid of messing up a watercolour in mid way, so I decided instead to start painting a collection of individual items. That way I could then remove the background and move each piece around and “build” a piece or artwork. Which is also time consuming but at least I won’t ruin a whole page of watercolour illustrations with one silly mistake. Here are some of the separate items below. You can see when you scroll down, how I combined them all to create different combinations. This stage of combining all of the various flowers was extremely time consuming as well. I had to individually scan in each separate element, crop the image, remove the background, then play with the colour settings. Next, I had to individually drag and position each flower to create a final pattern. If anyone knows the name of the above yellow flower, please do let me know in the comment area below! I would love to know it’s name. 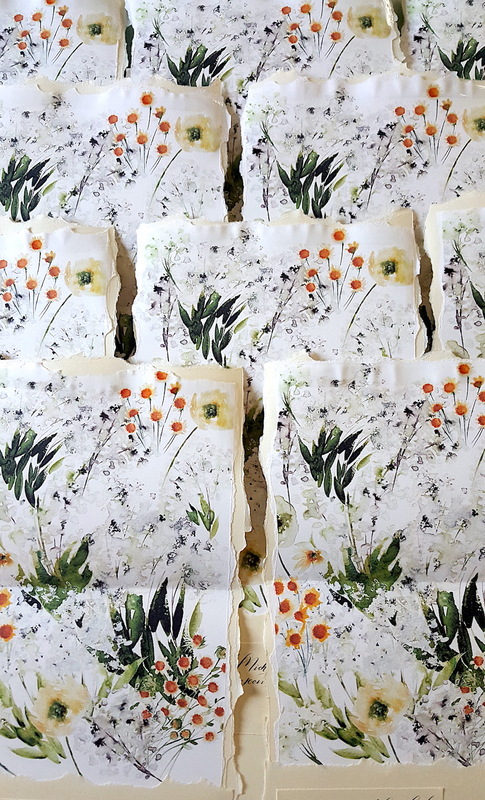 Following on underneath, here are some of the envelope liners that I designed. Whenever I do present a design concept to the client, I like to have at least 3-4 varying design options. The client can then select their favourite elements and we can move forward and make design revision. 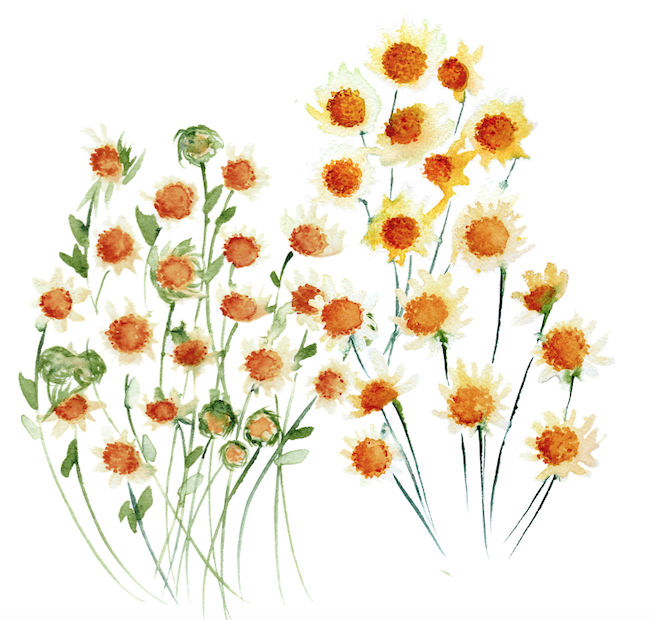 I do think that I have got rather carried away with all the daisies. But I have to get carried away in some element of my work and let my passion guide my creativity. Even if I do go overboard! Here below are the two final design concepts that I showed my client. The first design concept I used primarily cream papers, the second design concept I use mainly grey papers. You will see here that I actually produce the invitations and do not present them in digital format. I print them out and style them, so that my client can get a feel for how they will look once produced. I offered a different envelope shape and rsvp, information booklet as well. I have given you plenty of images below but for the sake of privacy I will not be sharing the invitation. The client sent some beautiful crochet, lace ribbons. All completely different and in size, width and style. Such an interesting feature! 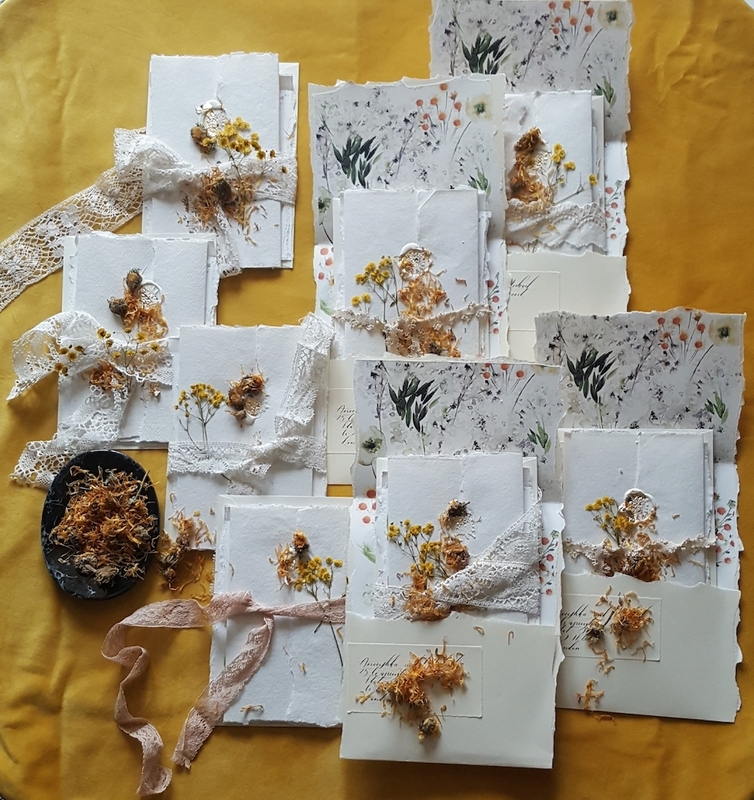 Also she sent some dried pressed yellow flowers and lots of marigold petals and flowers which I also added into the wax seal as well as placing a few within the ribbon. 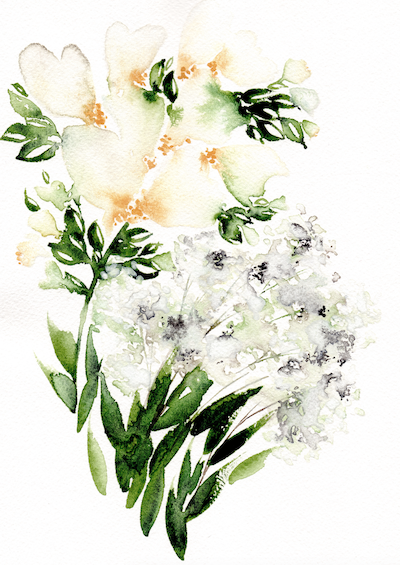 Bespoke watercolour wedding invitations, or custom design for that matter is very time consuming. Your bespoke design is not in existence yet and needs to be created after a lot of communication and artwork. Week 1 // Communication, emails, quotes, payment requests. Week 2-3 // Artwork illustrations, design work finalised. Week 3-4 // Design Revisions, presented to the client, final adjustments. Week 7-8 // Production, hand painting begins, gluing onto card. Week 9 // Assembly, wax seals, packaging and shipping. So on average it can take from two to three months. WHAT IS YOUR FAVOURITE PART OF THE DESIGN? If there is anything else that you would like to see, or know about, let me know in the comments below. If you would like to have a look at the full portfolio of luxury wedding invitations that I design, see here. If you would like to contact me and find out more then reach out here. Oh Joanne thank you so much. 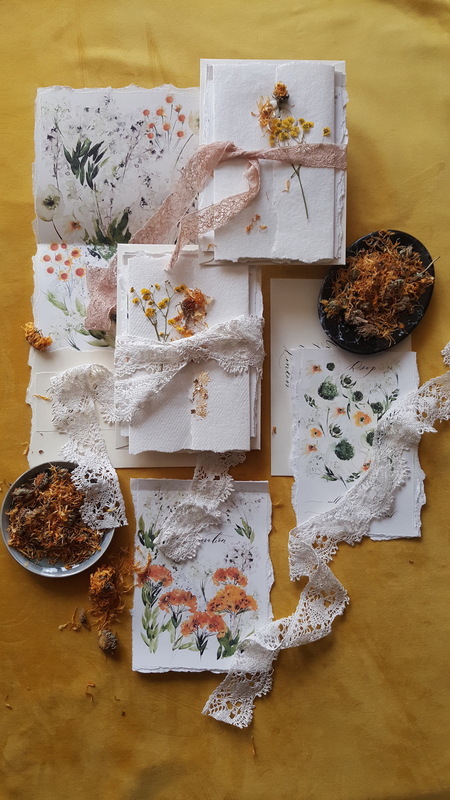 I was also so in love with the mismatched boho crochet ribbons and the dried marigold that she sent to me. OH THANK YOU PIA, custom work does take so long. I can hardly believe that I’ve been working on these invitations for two months. There’s a lot of back and forth communication and changes in the text (wording) along the way. Thank you so much for your support! You know I even surprised myself with the realisation that it takes two months on one client! So that literally means that I can only take on 3-4 custom design clients per year and that’s it! The other clients have to choose from my portfolio otherwise I cannot do that much work. I know so many invitation designers that buy in artwork but that is not what I do! I love this so much Rubana!! It’s so beautiful! 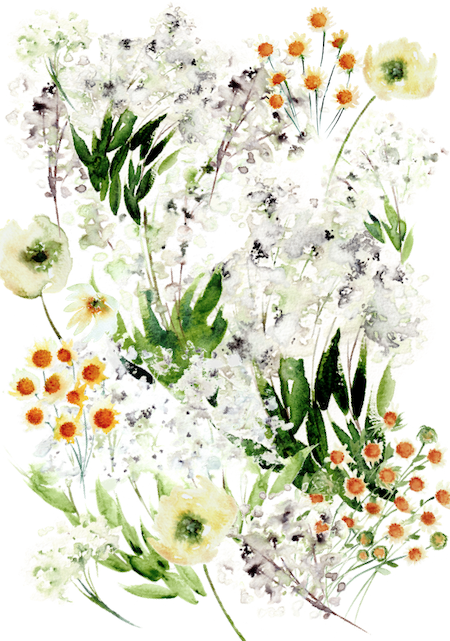 I love the colors and all of the different flowers you painted! Gorgeous!!! Dearest Vonda, thank you so much. I loved painting them all too, they were such a joy to paint once I got into it. Oh Ashley I am so incredibly touched that you came across, hit the link, and even took the time to look at this collection. It truly was a labour of love. Yes, you know I rather prefer the darker moodier look but at the same time I understand that brides want something lighter and romantic for their wedding. It has been a blessing to design something completely opposite to my style. I am so incredibly impressed by your work- and this most recent design is a personal favorite of mine! I know you prefer to work in darker, moodier hues, so this really just shows the level of skill and dexterity you have as an artist to be able to create something equally impressive on the complete opposite end of the spectrum! Keep up the good (and gorgeous) work! I am so humbled and honoured that you would think that I have set the bar high! You are going to do well too!!! Me too! You know how I am totally obsessed with black/ moody style. It has been great to play with a totally opposite colour palette and be able to give it my own spin. Thank you again!!! Oh I am so honoured by your lovely comments. I cannot thank you enough!!! Honestly. RUBANA!! What a wonderful amazing insight you shared with us all! And W O W gorgeous work as ever. Loved the explanations on white flowers cause those are tricky babies. Oh Katie, THANK YOU, THANK YOU, THANK YOU, hold on getting lost here because there are a few Katies that I know, what’s your handle on IG!! I have to thank you properly. Thank you so much for the sweet comment.You are so right, white flowers are so tricky to get right. 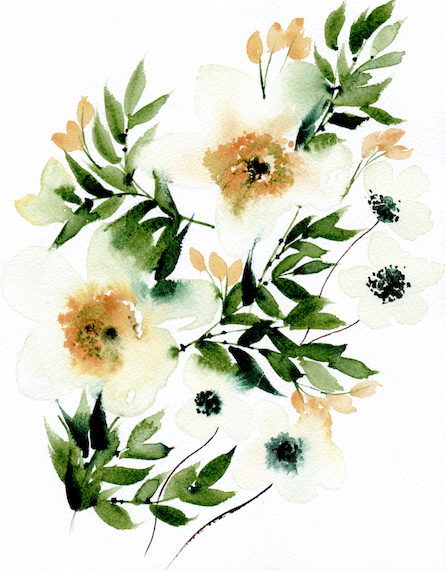 I would struggle with detailed watercolour, happy that I could do some abstract florals here! Right, gotch, I tried to get onto your website as well and to give you some love back, Google loves it when people leave a message on your blog and helps you to get seen on Google when people search for you or stationery designers. Do you have a blog? Thank you again my beautiful lady.